While utility prices have been steadily increasing, the cost of solar panel installation has dropped by more than 60 percent over the last 10 years. This decrease in cost, combined with favorable government incentives, a variety of payment options, and positive environmental benefits, makes switching to solar and taking advantage of renewable energy very attractive. However, the solar power industry can be confusing. That’s why we’ve put together this comprehensive guide—to answer some of the most important questions consumers have about solar, present the best solar companies in your area based on solar reviews from consumers, and help you decide which options are best for you and your situation. There are a variety of different types of solar companies out there that can help you to go green. Understanding the difference between these types of companies and what each one has to offer gives you a leg up when determining which company is best for you. Solar manufacturers: These companies produce the solar equipment that is installed on your home. Most manufacturers do not provide solar panel installation or financing services. Solar installers: These companies actually come out to your house and set up the photovoltaic panels created by manufacturers. Most solar panel installers are local companies that primarily operate in a specific area. Solar dealers: These companies have received permission to sell certain manufacturers’ solar products. Some dealers have their own in-house solar installation team, while others outsource installations to third parties. Full-service providers: These companies do everything to get you set up with solar outside of manufacturing the equipment. Full-service providers sell the panels, provide financing, and perform the installation. Vertically-integrated companies: These companies take care of every single aspect of the solar process, from manufacturing the panels to installing them on your roof. There are very few vertically-integrated companies in the solar industry, but those companies (SunPower and SolarCity, to name a couple) are huge players. Solar financiers: These companies strictly focus on providing financing for solar equipment and installations. Financiers usually partner with solar dealers and solar installers. Solar lead generation companies: These companies put their emphasis on generating leads and sales for other types companies within the solar power industry. Instead of selling or installing panels, lead generation companies put together contracts which are then sold to installers, dealers, and full-service providers. There are four primary ways to pay for a solar photovoltaic system: outright purchase, loan, lease, and power purchase agreement. The best option for you depends on your state of residence, financial situation, and housing status. Outright purchase: Purchasing a solar PV system outright is a good option if you have the funds to do so and are interested in a high dollar-for-dollar return. However, the actual return you will receive on an outright purchase is dependent upon the utility prices and incentives available in your state; higher utility prices and more incentives generally result in a larger savings over time. Loan: Financing your system with a loan is a great way to go solar if you have equity in your home but don’t have enough cash on hand to pay for it upfront. Many solar companies partner with financiers or banks that specialize in providing loans for solar projects. Contracts generally range from 5 to 20 years and offer interest rates between 1.99 and 4.99 percent, depending on your credit score. Plus, with a loan, you’ll still be eligible for state and federal solar incentives. Lease: Leasing a solar system can be beneficial if you live in an area with high utility prices and want to save on your electric bill without investing a significant amount of your own money in solar. With a solar lease, you will essentially be renting the system from a solar company or third-party financier for cheaper than what you were previously paying for power. However, keep in mind that when you lease, you do not own the system and therefore are not eligible for state or federal solar incentives. Furthermore, solar lease contracts typically last for 20 years, which could pose issues if you don’t stay in your current residence for that long. Power purchase agreement (PPA): Signing into a PPA is similar to a lease in that you can save money on your utility bill without investing in solar by allowing a third party to install a system that they own on your roof. However, PPAs differ from leases in that you will only pay for the system-produced power that you use at a flat, locked-in rate. While warranties are great because they help to protect both your equipment and your investment, they can be a bit confusing because there are several different types tied to solar systems—manufacturer warranties, product warranties, performance warranties, inverter warranties, and workmanship warranties. Some solar companies use vague verbiage and are not entirely upfront about which warranties will actually be attached to the solar system you purchase from them. However, if you are aware of the following warranties and what each of them covers, you’ll be better prepared to ask your solar rep and get solid answers before you sign a contract. Manufacturer warranties: These warranties come directly from the company that manufactured the solar panels. Product and performance warranties both fall under the umbrella of manufacturer warranties. Product warranties: These warranties are offered by the manufacturer and cover the solar panels themselves. If the panels fail or break due to manufacturing defects, environmental issues, or premature wear and tear, the manufacturer will replace them for free. Most product warranties cover panels for 10 to 25 years. Performance warranties: Sometimes referred to as “performance guarantees,” these warranties are offered by the manufacturer and cover the power output of the solar panels. Performance warranties ensure that your solar panels are not under-producing. If any of the panels lose more than a certain percentage (typically 10 to 20 percent) of their promised energy output during the life of the warranty, the manufacturer will replace those panels for free. It’s required by law that all solar panels come with at least a 25-year performance warranty. Inverter warranties: These warranties are provided by the company that manufactured the solar system’s inverter. If the solar inverter fails or is not able to handle the calculated energy capacity, the manufacturer will replace it for free. Depending on the inverter type—string or micro (see below for an in-depth explanation of the difference between these inverters)—the warranty could last between 5 and 25 years. Workmanship warranties: Sometimes referred to as “service warranties” or “installation warranties,” these warranties are offered by the company that sold you the solar system. These warranties cover labor-related defects, such as damage to your roof or other parts of your home or property as a result of solar system installation. Not every solar company offers a workmanship warranty, but the ones that do usually provide coverage for 5 to 10 years. There are two main types of solar panels that are used for residential projects: monocrystalline panels and polycrystalline panels. Technically speaking, monocrystalline modules are comprised of one crystal of silicon, while polycrystalline modules are comprised of several silicon crystals. The biggest difference between these two types of panels lies in efficiency rating, which conveys how effective the panels are at converting the sun’s rays into electricity for your home. Monocrystalline panels are generally more efficient than polycrystalline panels, which means you need fewer monocrystalline panels than polycrystalline panels to produce the same amount of energy. If you have limited roof space, monocrystalline panels are probably the best option. However, if you have plenty of roof space, polycrystalline panels should do just fine. Inverters are an important part of any solar PV system because they convert the direct current (DC) electricity that your panels produce into the alternating current (AC) electricity that is utilized by both your home and the grid. There are two main types of inverters used in the solar industry today: string inverters and microinverters. 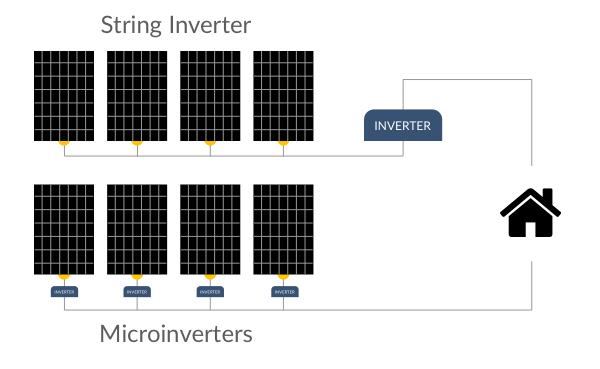 String inverters tie all of the panels in a solar system together into a circuit, or “string,” which means that anything that affects one panel will affect all of the panels. For example, if one panel on the string becomes shaded, all of the panels on that string’s production is dramatically decreased. Most string inverters are warrantied for 10 years. Microinverters, on the other hand, provide each solar panel in the system with its own inverter. Each microinverter operates independently of its fellow microinverters, which means that shading on one panel will not affect the production of any other panels. Microinverters typically come with a 25-year warranty. If you live in a particularly sunny area, you’ll probably be safe with a string inverter, which is the cheapest of the two options. However, if you live in an area that’s prone to shade or cloud coverage, you’ll be better off with a microinverter. Efficiency is a measure of a solar panel’s ability to convert sunlight into energy. The higher the efficiency rating, the more electricity is produced by the panel in a given amount of time. Efficiency ratings for solar panels generally range between 14 and 24 percent. While purchasing super efficient panels might seem like the best option, it’s not mandatory unless you have a small roof and a high power usage. If you have sufficient roof space to do so, you can most likely save money and receive the same output by adding a few extra, less-efficient panels to your solar array. What are the top benefits of solar energy? What rebates and incentives are currently available? What’s going to happen with solar incentives in the future? Are solar panels viable in cold climates? Will they still work when it’s cloudy/rainy/snowy? Should I invest in a battery pack along with a solar energy system? Do I need to repair my roof before installing solar panels? Solar energy is cost effective, reliable, sustainable resource that allows you to take control and ownership of your utility costs, take advantage of tax benefits, and take back your freedom from paying for-profit utility companies, all while generating your own clean, renewable energy onsite. Solar power also creates jobs to boost the economy and contributes to our nation’s energy independence so that we don’t have to rely on fossil fuel imports. Solar power systems derive clean, pure energy from the sun. As a result, installing a solar module on your home helps combat greenhouse gas emissions and reduces our collective dependence on fossil fuels that traditional electricity is sourced from, such as coal and natural gas. The actual cost of solar varies greatly depending on a number of factors, including system size, location, and available incentives. The best way to determine exactly how much it would cost you to go solar is to obtain a quote from the company that you’d like to work with. The amount you will save on your utility bill each month depends on a variety of factors, including solar system size, energy use, roof exposure, and local utility prices. System size/energy use: Installing a larger solar system that offsets a major portion of your energy usage will result in higher savings on your electric bill than installing a smaller system that only offsets a minor portion of your electric bill because less power will be pulled from the grid. Roof exposure: If you live in a sunny area, your solar panels will produce more energy than they would if you lived in a shady or cloudy area. More sun means more savings on your energy bill. Local utility prices: If you live in a state with steep electricity prices, you’ll see higher dollar savings on your bills than you would if you lived in a state with lower electricity prices. The easiest way to figure out exactly how much you can expect to save on your electricity bill each month is to obtain a quote from the solar company that you are interested in doing business with. When you first install a solar module, it will be connected to the public-utility power grid. During the day while the sun is shining bright, your system will power your home and send any surplus energy that you aren’t using back to the grid. At night when your system is no longer producing, it will draw power back from the grid. This process is regulated and tracked through what is known as net metering. As an alternative to net metering, which only requires one meter, a few states offer a feed-in tariff, which guarantees renewable energy generators payments for the full output of the solar system for a guaranteed period of time (typically 15 to 20 years). Implementing a feed-in tariff requires two meters, one to measure consumption and one to measure generation. The U.S. federal government offers a 30 percent tax credit, and many states offer their own incentives such as rebates, tax credits, performance payments, and tax exemptions. However, these incentives will slowly but surely go away as more and more consumers make the switch to solar. Talk to solar power companies in your area to find out which incentives and tax credits are currently available to you. Yes, solar photovoltaic panels will work in all climates provided that there’s adequate space and minimal to no shading. In fact, like any electrical device, solar panels are actually more efficient in cooler temperatures. While solar panels will still produce a measurable output in cloudy/rainy/snowy weather, they will not be as effective as they are when the sun is shining directly on them. For safety reasons, most solar energy systems will turn off during a power outage unless the system is connected to a battery backup. Battery storage is still a developing technology and is costly in comparison to capacity. If you’d like the peace of mind that comes along with knowing you’ll have power when the grid goes down, battery storage might be worth it for you. But if you live in an area where you rarely have power outages, it might make more economic sense to wait to purchase a battery pack until costs have come down. Most solar energy systems are warrantied for 25 years, but it’s likely that a system will continue to generate power for 30 to 40 years. Solar panels raise the value, as the running costs of the house are significantly reduced and the system may even provide a long-term income stream. Nationwide, the average home value is 15 percent higher if it has a solar energy system. However, it's important to note that an increase in home value typically only comes with solar systems that have been purchased with cash or a loan; leased solar power systems generally do not add value to a home, as they are someone else's property attached to the house. If you’re thinking about going solar, consider the age, condition, and cost of replacing your current roof. It doesn’t hurt to have a professional take a look at it as well. If you find that your roof does need to be repaired or replaced, it’s best to do so before the solar installation so that you won’t have to pay to have the panels removed and reinstalled in order to fix your roof a few years down the road. Be sure to talk to your chosen solar company about it beforehand, as many solar panel installers have partnered with roofing contractors and may be able to land you a discount. Generally, solar panels require little to no maintenance on your part. Unless you live in an area that is particularly smoggy or dusty, proactive panel cleaning isn’t really necessary. Having to brush snow off your panels shouldn’t be an issue either, as snow will quickly melt or fall off of panels that are mounted at an angle higher than 15 degrees. Consumers should look for a solar company with a solid track record, financial stability, high quality equipment, great warranties, a good reputation, and positive reviews. We've ranked and reviewed hundreds of solar power companies from across the United States and gathered thousands of solar reviews from consumers to help you find the best solar companies in your area. Want to contact our top-ranked solar company, Sungevity? Please call 855-322-8657.